The cuff that I chose to make is light and easy to wear. I combined wire, textured poly clay, a hand crafted faux enamel bead, silk, a tiny brass charm, and two buttons. Buttons sent by my partner, the lovely Marti Conrad. A large rust color ceramic button stamped and glazed with a beautiful frosty blue glaze. A wood flower shape button in beige, edged in rust, and three lovely textured glass buttons which I chose not to use at this time. They may become earrings later. Thank you Marti, I love the buttons you sent, hope you like what I made with them. Visit Michelle's Blog to see what the other participants created with their buttons. Thank you to Michelle Mach for organizing this fun button swap and challenge. do not copy, print, or publish without my written permission. Are your eyes tired after looking at more than 100 blue bracelets? Do you want to celebrate Cinco de Mayo with a fiesta on your wrist? 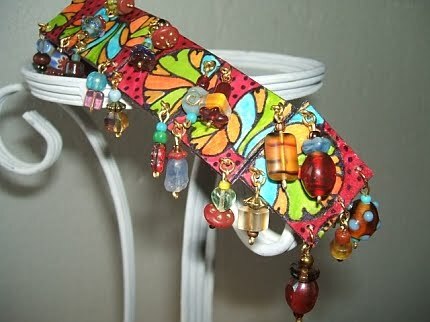 Or maybe you just want something colorful to wear with your jeans....well here is the bracelet you need. Seven hand painted tiles loaded with little dangles that move when you move...how fun is that? Please do not copy, print, or publish without written permission. an advocacy group for children rare disease awareness. The Global Genes Project sends the bracelets to one of 7000 families having children with rare diseases to show love and support. 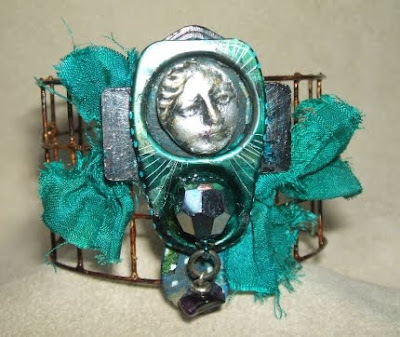 Please visit the talented Lori Anderson's Blog to link onto the blog hop list...see what other jewelry artists contributed. Thank you Lori for organizing yet another wonderful blog hop. New cuff has been added to Moxie Gallery. Wear the classifieds on your wrist...a real conversation piece. Read more about this cuff here. Please do not copy or publish without written permission. Make one blue bracelet in an adult size...the bracelets will be sent to the Global Genes Project, an advocacy group who launched "7000 for Hope", a children with rare diseases campaign. The bracelet will be given to one of 7000 families who have children with rare diseases to show them love and support. 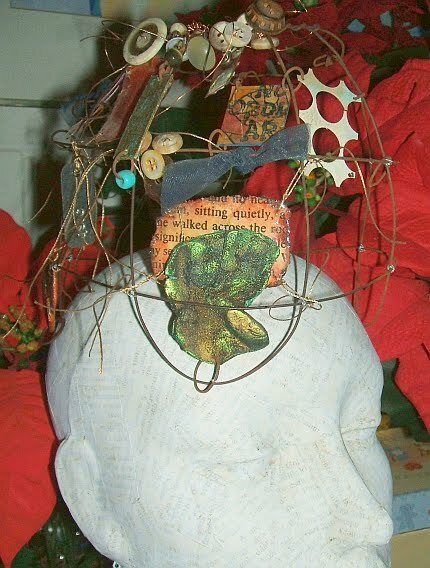 Be part of this project... please click on LORI ANDERSON'S BLOG for detail information. Thank you Lori for doing your part in this effort....please join us. New cuff ready for purchase at Moxie Gallery. Title: Yemaya-goddess of the sea. Honoring the patron saint of sailers and balseros. Balseros are Cubans who cross the ocean on make shift rafts trying to get to the United States. Unfortunately many do not make it. 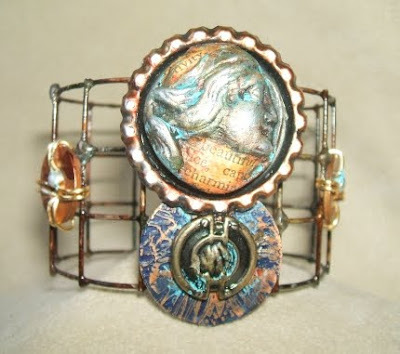 See more views of the cuff at Moxie Gallery.